As I Lay Dying will perform at 10 p.m. on Friday, April 5 in Alumni Hall. This event is free, ticketless and only for Penn State University Park students with valid student photo id. Students will be admitted on a first come, first serve basis. This event is sponsored by SPA LateNight. 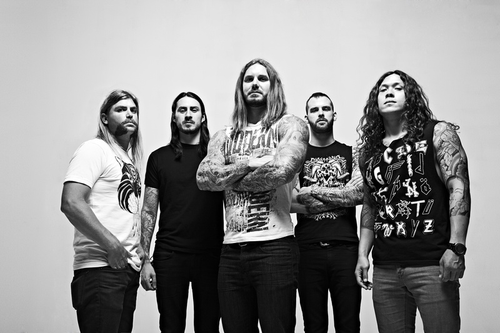 As I Lay Dying is an American metalcore band from San Diego, California. Their band name derives from the novel of the same title by William Faulkner. Founded in 2000 by Tim Lambesis and having completed their first Line-up in 2001, the band’s line-up consists of vocalist Tim Lambesis, drummer Jordan Mancino, lead guitarist Nick Hipa, rhythm guitarist Phil Sgrosso, and bassist Josh Gilbert. Signed to Metal Blade Records, As I Lay Dying has released four studio albums, one split album, and one compilation album. As I Lay Dying’s fourth studio album, ”An Ocean Between Us” peaked at number 8 on the Billboard 200, and number 1 on the Top Rock chart. The band has performed at Wacken Open Air, With Full Force, Soundwave Festival, Sounds of the Underground, Warped Tour, and Taste of Chaos. In 2007, As I Lay Dying won the “Ultimate Metal God” award from MTV2 at the first annual “All That Rocks” special, was named “Artist of the Year” at the San Diego Music Awards in 2008 and was nominated for a 2008 Grammy Award for the song “Nothing Left”. The band wrote and recorded their latest album, ”The Powerless Rise” on the course of a three year process and was released in May 2010. It has been considered by many to be their best work yet.